Can’t stop texting? If you’re a teenager, it may be to blame for falling grades and increased yawning in school, according to a new Rutgers study. Ming’s research is part of a small but growing body of evidence on the negative effects of electronics on sleep and school performance. But few studies, Ming says, have focused specifically on instant messaging. To conduct her study, Ming distributed surveys to three New Jersey high schools – a suburban and an urban public school and a private school – and evaluated the 1,537 responses contrasting grades, sexes, messaging duration and whether the texting occurred before or after lights out. 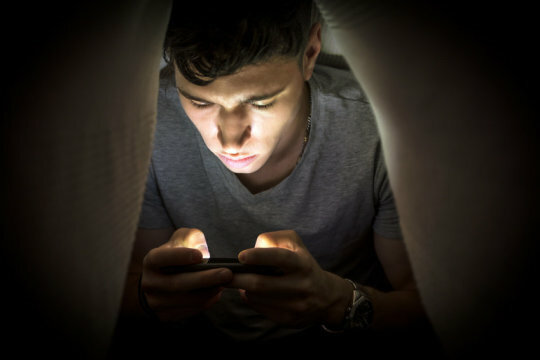 Students who texted longer in the dark also slept fewer hours and were sleepier during the day than those who stopped messaging when they went to bed. Texting before lights out did not affect academic performance, the study found. Although females reported more messaging overall and more daytime sleepiness, they had better academic performance than males. “I attribute this to the fact that the girls texted primarily before turning off the light,” Ming says. The effects of “blue light” emitted from smartphones and tablets are intensified when viewed in a dark room, Ming says. This short wavelength light can have a strong impact on daytime sleepiness symptoms since it can delay melatonin release, making it more difficult to fall asleep – even when seen through closed eyelids. Ming notes some benefits to early-evening media use, such as facilitating collaboration for school projects, providing resources for tutoring, increasing school readiness and possibly offering emotional support systems. Research Brain disorders, late texting, teenage health. permalink.